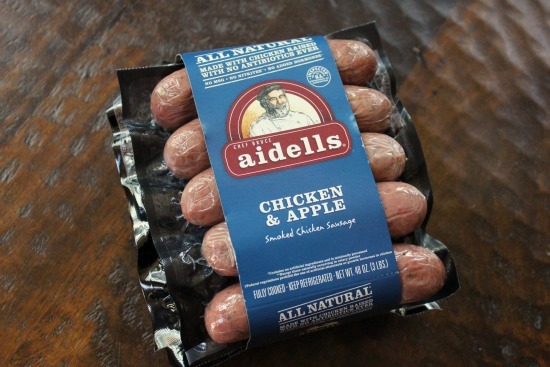 Aidells...a reliable source of clean meat products? Now this email definitely contradicts what I was told on the phone (see original blog post below) AND what is written on their "new" packaging! I am led to believe that this company is unclear about their own product and also apparently misleading many people. If you choose to include Aidell's products in your diet, please always choose the organic line of products only. This whole experience has completely reinforced my new dietary goal of further reducing my intake of processed meat products (jerky, deli meats, sausages, bacon, etc). Right now, I'm down to just once a week which I am OK with...for now. 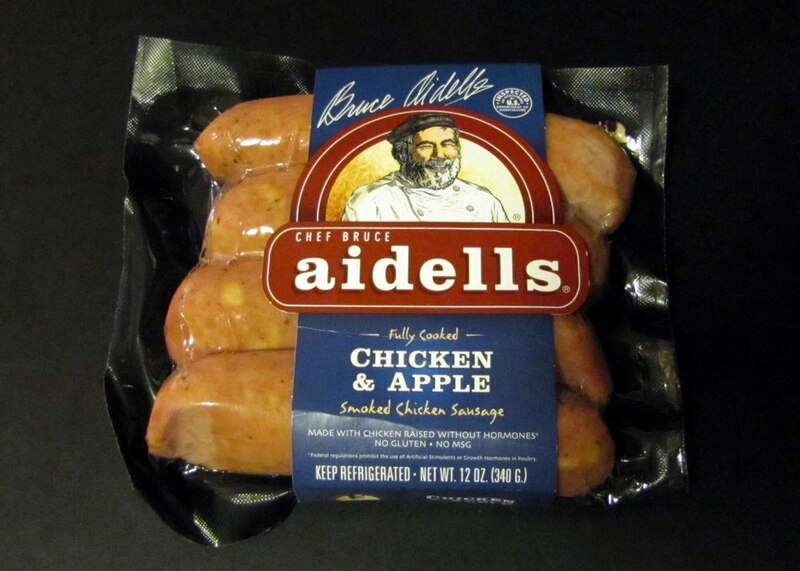 I will no longer include Aidells on my list of acceptable brands. You just can't trust processed meats! Certainly not meats processed by the industry. We're much better off cooking all of our food ourselves. If you haven't seen this talk by Michael Pollan...watch it now! So, as many of you know, I began investigating Aidells products for "cleanliness" earlier this month after I noticed a discrepancy in their packaging. While making a trip to Costco and Grocery Outlet in another town recently, I realized that Aidells sells BOTH "organic/hormone/antibiotic free" and "all natural" versions of many of their products. I think this is very deceiving as "all natural" means close to nothing in the world of processed meat products and there's no reason to make two versions of the same product in my opinion. Either you produce quality or you don't! From left to right: Aidells older packaging with no mention of antibiotics, only hormones at the bottom, Aidells new packaging with the antibiotic and hormone info more prevalent at the top, and Aidells organic packaging. Me: "Hi, I'm calling in regards to your products because I am a little confused as to how I am to be certain whether or not they contain antibiotics." Rep: "Which product are you inquiring about?" Me: "Well, sort of all of them but let's go with the chicken apple sausage. If I buy the nonorganic sausages, am I to assume they are made with chicken that contains antibiotics because the packaging does not state that they are antibiotic free and your online allergen info doesn't either. In fact, according to that online information page, most of your products may contain chicken raised with antibiotics." Rep: "No ma'am, all of our products are 'all natural' and made with all natural chicken." Me: "I understand that. But 'all natural' by definition, does not mean without antibiotics. I am asking specifically about antibiotics." Rep: "I'm sorry, but I'm going to have to do some research to find out the answer to your question because you are right, this information is not listed on the allergen page of our website." 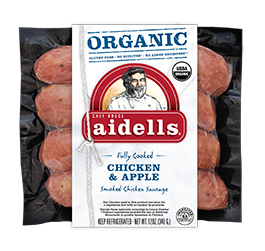 All of our products at Aidells have been and are always made with chicken and turkey that is hormone free and raised without antibiotics. We do not use the "all natural" label to imply this fact as you are correct, that is not what all natural means. The reason for the discrepancy in the packaging and allergen info is because neither are up to date, and we apologize for that. We are in the process of changing our packaging and you will now see that the packaging states that our chicken is never raised with antibiotics or hormones so look for that for assurance. Am I satisfied? Definitely. I trust that their chickens are humanely raised as they say they are and they comply with the standards set forth for all of their claims. I will still always choose the organic line of Aidells products and the same rules will always apply for me when I do purchase processed foods. ALWAYS READ THE ENTIRE LABEL and NEVER be afraid to ask questions! Meatless Monday...3rd time's a charm!